If there is more than one diagram, study any heading, key or source for each. Decide what the vertical and horizontal axes measure, and what the bars show. Look for similarities, differences, changes and trends. 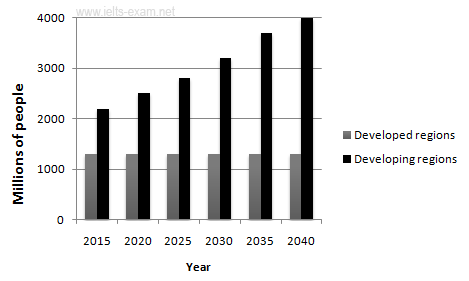 Sometimes in the exam you can be asked to write about a graph with future trend. You should write your answer in the same way as before, but instead of using the past simple, change the grammar and use future tenses. The graphs below provide information on global population figures and figures for urban populations in different world regions. The first graph shows the trend in world population growth between 1800 and 2100, while the second graph gives predicted urban population figures for the next 25 years. 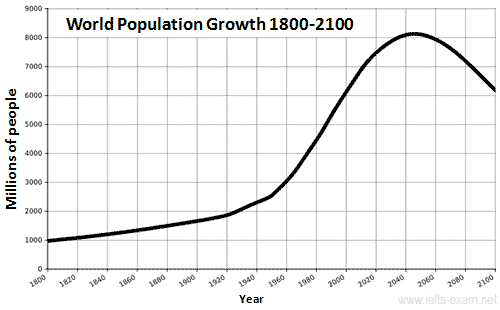 The world population has experienced continuous growth since 1800. Between 1800 and 1950, the population grew slowly from just under 1 billion to 2.5 billion people. After that, the growth rate increased and currently the figure is around 6.5 billion. Projections show a continued increase in population in the near future, but a steady decline in the population growth rate. The global population is expected to peak at 8.2 billion by 2050, and then decline to around 6.2 billion by 2100. The predictions also show that almost all urban population growth in the next 25 years will occur in cities of developing countries. In developed regions, on the other hand, the urban population is expected to remain unchanged at about 1.3 billion people over the next two decades. The graphs show that the global population increase will not occur evenly throughout the world, but will be greater in some areas than others. The global population has grown from 1 billion in 1800 to 7 billion in 2012.